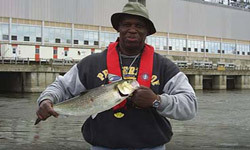 Top shad run fishing guides in Montreal recommended by Freshwater Phil. Every spring, millions of shad make a spawning run from the Atlantic Ocean, coming up many of the rivers on the Eastern seaboard to spawn. Unfortunately for the shad, they won't swim up fish ladders, so they get stuck by the millions at 2 locations near Montreal. During the annual shad run, thousands fish from shore on the Riviere des prairies, but few venture out into the treachurous current by boat. The Carillon dam is equally productive, but has more boat traffic and a shorter shad run, only 2-3 weeks long. American shad are caught almost exclusively by drifting dart jigs in the current. The shad guides often land 100+ shad per day, most in the 3-6 lbs weight class. 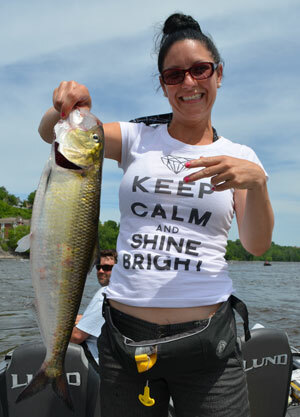 The annual shad run near Montreal typically starts around mid May, and ends by mid June. Boat Specs: 17.5 Crestliner, 70 HP engine. Best time: Mid May until mid June. Daily rate: $250, up to 2 people, tips welcome. Contact Tony about a guided fishing trip by clicking here. Boat Specs: 17.5 foot Lund, 75 HP engine, GPS, sonar. 3 people maximum.200$ for 1-2 people, 300$ for 3 people. Contact Patrick about a guided fishing trip by clicking here.